Emma Greenfield lives with a wild imagination in the backwoods of eastern Arizona. A love of reading naturally led to her love of writing. Her goals when writing romance is to bring the characters to life so that the reader feels that they are right there in the story. She lives with Boots and Ellie, her two kittens and lives a green lifestyle off the grid. To ask Emma Greenfield questions, please sign up. 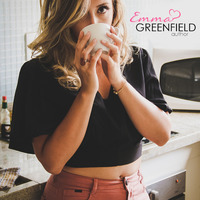 Emma Greenfield hasn't written any blog posts yet. We’d love your help. Let us know what’s wrong with this preview of Dawn Patrol by Camille Picott. We’d love your help. Let us know what’s wrong with this preview of Dorm Life by Camille Picott. We’d love your help. Let us know what’s wrong with this preview of Gray by Lou Cadle. We’d love your help. Let us know what’s wrong with this preview of Point of Impact by Kyla Stone. We’d love your help. Let us know what’s wrong with this preview of The Collapse - Solar Crash Book 1 by E.S. Richards. We’d love your help. Let us know what’s wrong with this preview of Take the Hit by Harley Tate. We’d love your help. Let us know what’s wrong with this preview of Arrows of the Queen by Mercedes Lackey.